At first sight, Survey Club looks like a great way to make some extra money by taking online surveys. 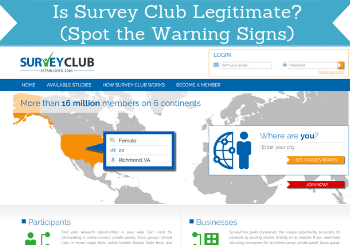 But is Survey Club legitimate or is it just a scam to stay away from? I have joined and tested the site myself – let me reveal right away that I do not think the site is completely transparent about what it really offers. In this Survey Club review I will give you all the details, so you can see exactly what to expect and judge for yourself if it will be worth it or not. What is Survey Club and what does the site offer? Survey Club was established in 2005 so it has been around for a while. This does however not guarantee quality and good opportunities. So let’s look at what this survey site offers, so you can see if it will be worth it. Before you join, it looks quite straightforward what Survey Club offers. It looks like most other survey sites, where you can join and then get paid to share your opinion. Even after you give your email, it still looks like most other survey sites. You have to fill out a profile, and then you will get to the paid survey opportunities in the members area. The sign-up process on Survey Club. However, since I have taken hundreds of online surveys myself, I know the tricks some survey sites use, and I spotted something already in the joining process that gives away what Survey Club might really be about. That is step 2, which is recommendations of other survey panels. You rarely see this on survey sites that offer opportunities to actually earn on the site – it does happen, but not often, so this made me suspicious. So let’s look at what then happens after you go through this sign-up process. From the sign-up process, I expected that Survey Club might mostly just be about promoting other survey panels to make money by referring other people to them. In addition to this, the site looks very much like Survey Scout I have previously reviewed, and from the address of the company, it is also possible to see the same company is behind these two sites. So I expected they would be similar in many ways – and they are. But there are also some differences. Let’s look at what you then get on Survey Club. In my experience and by comparing Survey Club to other sites I have reviewed, it seems the main goal of this survey site is to match you with other survey panels. The reason for this is that they will get paid a commission for each participant they recruit to these panels. Not as such anything wrong with this, but I do not like that the site looks like it is focusing on giving you access to great paid surveys when it then turns out the main goal might instead be to just forward you to other panels to earn a commission themselves. If it was a great list of survey panel you would get with a lot of in-depth information to help you find the best sites for you, it could maybe be useful – that is in my opinion however not the case on Survey Club. Some of the survey panels Survey Club recommends. It is, first of all, not a very long list of available survey sites. Secondly, you do not get any in-depth information to help you find the best sites for you. As you can see on the image above, all you get is the name, one promotional sentence to describe each panel, and then a link you can join through. 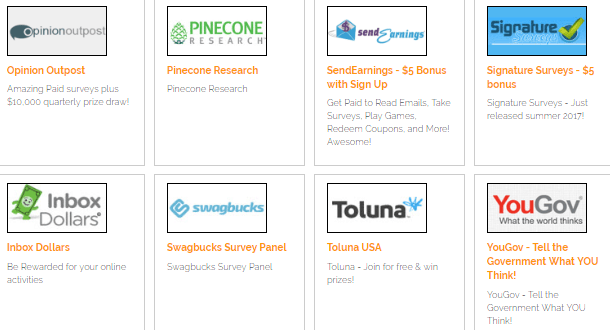 In their defense I must say that most of the sites on the list I have seen are legit sites and there are some great sites recommended like for example Toluna and the exclusive survey panel PineCone Research. However, I also saw they advertised a site like Signature Surveys that I would NEVER recommend joining, as it in my opinion is just a waste of time. This makes it clear to me that it is not so much about providing high-quality and helpful info to the you and other users but about promoting what can earn them commissions. I understand they need to pay for the cost of running the website etc. so I do not have a problem with them making money. But I think there should be more focus on providing more details and only recommending truly good and useful survey sites. After you log in to Survey Club, you can also find a tab called “available studies”. According to the site itself, you can here find studies to take and will be paid into your Survey Club account. This makes it look like it could potentially also offer something else than just promoting other survey panels. However, I have not been able to confirm this, as this is the screen every time I checked this opportunity. The available studies area always looks like this for me. It is not unusual that you at times cannot find available studies on a survey site, so just because I did not find any does not mean that it will always be like that. To look deeper into this I took a look at the studies they promote on the front page before you log in. Here you can find a list of available studies depending on where you live. On the front page of Survey Club it looks like there are many available studies. It looks like there are quite a few available studies. The problem I encountered was however that it does not seem updated. I tried to click MANY of these studies to see where it would take me. All the ones I tried took me to this screen. All the studies I tried were closed. All of them were apparently closed. This does not mean it will always be like that or that it will be the same for you. But it means that you should not expect too much from these survey opportunities. As you can see, I, for example, had a lot of available research studies shown before logging in. When clicking them they were however closed, and when I joined and logged in, there were none available. There is one way it looks like you can earn directly on Survey Club for sure. It is by inviting friends to join. If you invite a friend that joins, you will get $1. However, this is something you in my opinion should not expect too much from. First of all, you can maximum get paid $5, so you can only get paid for inviting 5 friends. Not really a great earning opportunity, right? It will not even take you close to the payout threshold. Also, before inviting any friend to any platform, you need to make sure it is something you can really recommend. If you invite a friend that feels it is a waste of time, they might stop trusting your recommendations in the future – not really worth that to earn $1, right? So if you use this option, be sure that you can truly recommend SurveyClub. According to Survey Club itself, you can earn on the site itself and get paid there. Once you have earned $20, you can get paid through Amazon gift cards or check. 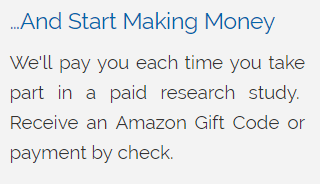 You can supposedly get paid in Amazon gift cards or check on Survey Club. There are many survey sites that offer Amazon gift cards or check as rewards, so it is in general definitely possible to earn these rewards on survey sites. I have however not been able to reach an amount on Survey Club to check if and when they pay out, as I have not been offered any surveys there. I have only been offered links to other survey panels I could then go to and sign up and then earn on those sites. If you want to join Survey Club, it can be a bit confusing to find out who can join. When you look in the FAQ section on the website, it says that anyone 13 years or older living in the US, Canada, UK, and Australia can join. However, when you are on the sign-up page, you can choose between many more countries. Also, on the front page, it says it has 16 million members from 6 continents. So from this, it looks like you can probably join no matter where you live. Is Survey Club worth joining? I honestly cannot see any reasons to join Survey Club. In my opinion, the focus of the site is to promote other survey panels to make money by getting you to sign up. This is clear from both the opportunities you can find on the site, the sign-up process and the emails you start receiving after signing up. From other survey sites, you will receive an email when they have a new survey available to you. The emails from Survey Club are promotions of other survey panels they want you to sign up for. It is fine that it promotes other panels. I just think there is too little focus on quality, and there is absolutely no need to sign up just to get a short and superficial list of survey sites, where not even all of them are worth joining. You can find a list of the best survey sites many other places without having to sign up for anything. 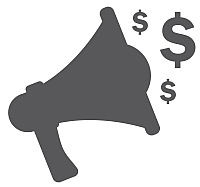 You can for example check out a list of the top 10 paying survey sites here. So in my opinion Survey Club is just a waste of time. I think it is pretty clear from this review that Survey Club is NOT a survey site I recommend. This does however not mean it is not legit. The survey sites it promotes are legit, and it does not spam you or things like this. I do however still not think it is worth it. But let’s sum up the pros and cons of the platform, so you can get a better overview of why that is before making your own decision about joining or not. Overall, I do not see any good reasons to join Survey Club. It will in my opinion not give you any good information or advice about the best opportunities for you. Most of all it will just give you access to a short list of other survey panels with superficial information about these. There is no need to join to get access to this kind of information. No matter where you live, there are many great survey sites with better opportunities, and where you can actually earn daily on the sites themselves. You can for example check out the list of the best survey sites in your country here. All the sites on this list are legit and sites where you can earn on the sites themselves – and they are of course also all free to join and use. If you have any comments, questions, or have any experiences with Survey Club yourself, I would love to hear from you in a comment below.